We challenge YOU to design solutions that accelerate and increase sustainable transport use in Newcastle, Australia. Great ideas and solutions are everywhere and there's huge potential to explore complex city problems through design thinking and crowdsourcing. This challenge provides an opportunity for anyone around the world who is passionate about the future of transport to contribute new ideas and ways of thinking to the development of mobility solutions in this amazing city. We welcome entrepreneurs, researchers, scientists, students, and anyone eager to contribute, to jump into this challenge and imagine solutions which change behaviours. Enter as an individual or part of a team and you could win US$2000 and the chance to have your solution developed with AU$25,000 in funding through City of Newcastle's Startup Catapult program. Newcastle, on the East Coast of Australia, is a growing and vibrant area which is connected to Sydney via rail and road and to the world by sea and air. Its community enjoys a special relationship to its harbour and beaches and it offers its residents a high quality of life, affordable housing, exciting recreational and cultural options and activities and quality health facilities. There is a wide range of educational opportunities through quality schools, TAFE and the University of Newcastle attracting students from across the nation and globe. Newcastle is also home to many mid-sized service corporations and known for the high level of productivity and innovation of its workforce. It is a popular cruise ship, conference and short break destination, and it services a regional population in excess of 600,000 people. Because of these unique qualities and attributes, Newcastle is facing unparalleled growth and has recognised the need to develop innovative solutions to traditional problems in order to address rapid change. The City's challenge is to manage this in a way that optimises social and economic benefits, reduces the impacts of inefficient travel and energy consumption, all while ensuring a globally attractive quality of life and conducive business environment. This includes accelerating the transition of major modes of city mobility to electric vehicle as well as multi-modal networks to deliver time critical, accessible options while promoting cycling, public transport and walking linkages to decrease reliance on private vehicles and reduce the city's carbon footprint. That's why we're looking for future mobility solutions for Newcastle, Australia that will leverage our new smart city infrastructure and deliver greater transport flexibility for the city's users. The Challenge is part of the $13m Smart Moves Newcastle project which received $5m through the Federal Government’s Smart Cities and Suburbs program in 2017. 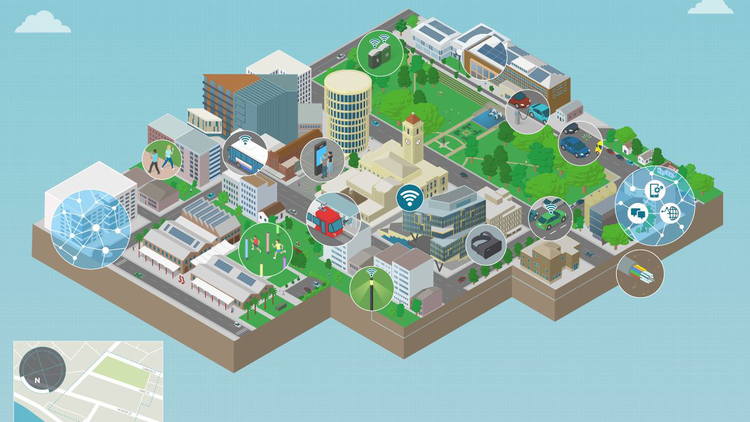 Through Smart Moves Newcastle, the City of Newcastle is partnering with a consortium of technology businesses to provide an integrated network for transport, energy and digital infrastructure, transforming Newcastle into a ‘living lab’. Eighteen04 is collaborating with the City to deliver the Newcastle Smart Mobility Challenge.